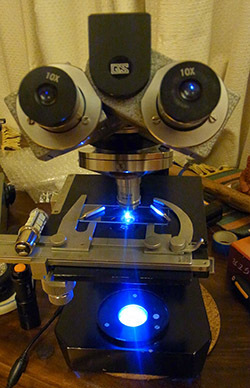 Optical microscopes are just one type of scope you’ll find on Hackaday.io. There are also atomic force microscopes, scanning electron microscopes, and more! I’ll cover those on a future Hacklet. If you want to see more awesome optical microscopy projects, check out our new optical microscope projects list! If I missed your project, don’t be shy, just drop me a message on Hackaday.io. That’s it for this week’s Hacklet. As always, see you next week. Same hack time, same hack channel, bringing you the best of Hackaday.io! CMOS imaging chips have been steadily improving, their cost and performance being driven by the highly competitive smartphone industry. As CMOS sensors get better and cheaper, they get more interesting for hacker lab projects. In this post I’m going to demonstrate a few applications of the high-resolution sensor that you’ve already got in your pocket — or wherever you store your cell phone. First lets quickly review image sensors. You’ve probably head of CMOS and CCD sensors, but what’s the difference exactly? CCD and CMOS imaging sensors: from this excellent page at CERN. As the figure above shows, CCD and CMOS sensors are both basically photodiode arrays. Photons that hit regions on the chip are converted into a charge by a photodiode. The difference is in how this charge in shoved around. CCD sensors are analogue devices, the charge is shifted through the chip and out to a single amplifier. CMOS sensors have amplifiers embedded in each cell and also generally include on-chip analogue to digital conversion allowing complete “camera-on-a-chip” solutions. Because CMOS sensors amplify and move the signal into the digital domain sooner, they can use cheaper manufacturing processes allowing lower-cost imaging chips to be developed. Traditionally they’ve also had a number of disadvantages however, because more circuitry is included in each cell, less space is left to collect light. And because multiple amplifiers are used, it’s harder to get consistent images due to slight fabrication differences between the amplifiers in each cell. Until recently CMOS sensors were considered a low-end option. While CCD sensors (and usually large cooled CCD sensors) are still often preferred for scientific applications with big budgets, CMOS sensors have now however gained in-roads in high performance DSLRs. We’re not quite sure where [Andy] hangs out, but he recently found a pile of broken microscopes in a dumpster. They’re old and obsolete microscopes made for biological specimens and not inspecting surface mount devices and electronic components, but the quality of the optics is outstanding and hey, free microscope. There was a problem with these old scopes – the bulb used to illuminate specimens was made out of pure unobtainium, meaning [Andy] would have to rig up his own fix. The easiest way to do that? Some LEDs made for car headlights, of course. The maker of these scopes did produce a few for export to be used in rural areas all across the globe. These models had a 12 Volt input to allow the use of a car battery to light the bulb. A LED headlight also runs off 12 Volts, so it was easy for [Andy] to choose a light source for this repair. A little bit of dremeling later, and [Andy] had the new bulb in place. An off the shelf PWM controller can vary the brightness of the LED, controlled with the original Bakelite knob. The completed scope can easily inspect human hairs, the dust mites, blood cells, and just about anything down to the limits of optical microscopy. Future plans for this microscope might include another project on hackaday.io, a stage automator that will allow the imaging of huge fields at very high magnification – not bad for something pulled out of the trash.